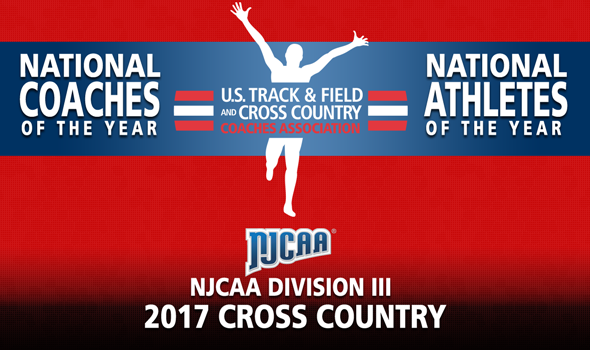 NEW ORLEANS – National Athletes and Coaches of the Year for the 2017 NJCAA Division III Cross Country season were announced Tuesday by the U.S. Track & Field and Cross Country Coaches Association (USTFCCCA). These awards are based on the results from the 2017 NJCAA Division III Cross Country Championships that happened this past weekend in Westfield, Massachusetts. Abshir Yerow capped an amazing freshman year with an individual title at the 2017 NJCAA Division III Cross Country Championships. Yerow covered the five-mile course in 26:24.5 and outkicked Sandhills (N.C.)’s Daniel Taylor as well as Kingsborough (N.Y.)’s Humberto Wallace down the stretch for the win. No one could stop Chyanna Bernier from obtaining national glory this past weekend at the 2017 NJCAA Division III Cross Country Championships. Bernier pulled away to win the individual title in the women’s race with a time of 18:43.7, a full eight seconds clear of SUNY Adirondack’s Sheri Metcalf. Jim Macnider led Harper College to the men’s team title at the 2017 NJCAA Division III Cross Country Championships. The Hawks put three runners in the top-10 and four others in the top-30 as they scored 84 points to beat runner-up Suffolk (N.Y.) by 16 points. Jim Macnider led Harper College to the women’s team title at the 2017 NJCAA Division III Cross Country Championships and barely missed a record in the process. The Hawks scored just 24 points in the winning effort, just two points shy of tying the meet scoring record set by Mohawk Valley (N.Y.) in 2010.